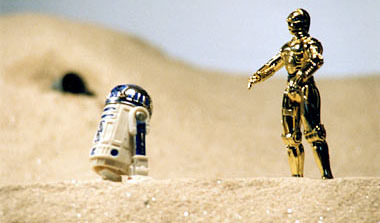 R2-D2 & C-3PO part ways atop a Tatooine sand dune. This site is a tribute to Star Wars and Star Wars Action Figures featuring work in Photography, Scale Modeling, and Graphic Design. Time is running out! Download your next Star Wars Halloween Jack-O-Lantern.